Use Control+F to search for a name or place. Robert Midgley and Ann Thompson left Barmby on the Marsh East Yorkshire some time after 1850 and migrated first to Canada but then entered the U.S. at New York. See Midgley of East Yorkshire. Their eldest son George Midgley migrated with his parents from England to America when he was a young boy in the 1820-1850 period. George later had a brother, John born in the U.S. George married and had several children [Field, Etta and Bessie]. This family lived in Morley NY and most of the relatives are buried there, with the exception of Etta who married a Dr. Milo Secombe and lived and died in Auburn, NY. Samuel Midgley married Jane Burnett and left for America in January 1845. 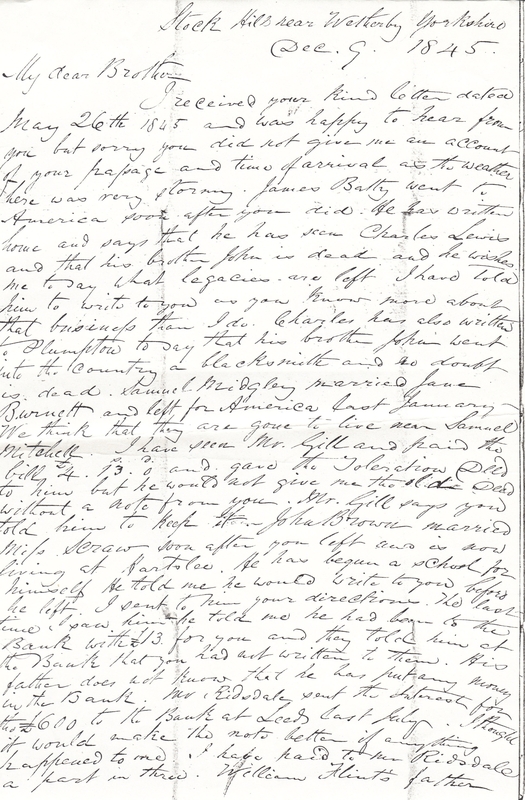 See letter and translation from Stock Hill [Stockeld] near Wetherby dated December 1845. David was a son of Joseph Midgley b. 1771 at Hambledon in Yorkshire. He migrated to Canada in 1882 with his wife, Elizabeth accompanied by David's sister, Susannah, son Thomas and two grandsons, Frederick and Walter. Eventually the family re-migrated to California USA and settled at Menlo Park. In the1851 census David was described as a farmer of 54 acres employing one labourer. By the 1881 census he was described as a corn miller and farmer of 98 acres employing three men at Woodhouse near Normanton. Philip and Elizabeth Midgley migrated to the U.S. about 1838 when John Calvert Midgley was about seven years old. The family were in Minnesota in 1860. Washington state.This is Rella's husband's great grandmother. * Ida Ina b. 1871 Osage, Iowa, buried at Wheatland, North Dakota. Ida is Norma's great-grandmother. 1. John Calvert2 Midgley (Philip1) was born 24 May 1832 in Yorkshire, England, and died Bet. 1900 and 1910 in Wheatland, North Dakota. He married Ellen Kinney 12 Jan 1853 in White Creek, Kenosha, Wisconsin, daughter of Benjamin Kinney and Maria Metcalf. She was born 03 Nov 1835 in Chadwick Mills, Oneida, New York,, and died Aft. 1910 in Wheatland, North Dakota. John Calvert's father belonged to royalty in England but he married a commoner so was disowned. He later emigrated to America when he was 7 years old according to information given to Rella Gleaton. According to Laura Mercer Paasche they moved to Winona, Minnesota in 1843. Birth Date verified by 1860 census. Birth Date verified by 1860 census. 2 i. Elizabeth Ellen Marie3 Midgley, born 21 Aug 1858 in Wytoka, Winona, Minnesota; died 1934. 3 ii. Amanda Eliza Midgley, born 1860. 4 iii. Minnie Electia Rose Midgley, born 1862. 5 iv. Ernest Calvert Midgley, born Apr 1864 in Minnesota. 6 v. Mary Bell Lillian Midgley, born May 1868 in Wisconsin; died 20 May 1944 in St. Louis, Minnesota. 7 vi. Ida Inace Lillian Midgley, born 05 Jun 1871 in Osage, Mitchell, Iowa,; died 09 Nov 1953 in Grand Rapids, Kent, Michigan, burried in Detroit Lakes, Minn.
8 vii. Charles John Midgley, born 27 Apr 1875 in Iowa. 9 viii. William Harvey Midgley, born 17 May 1878 in Iowa. 10 ix. Bertha Florence Midgley, born 01 Apr 1880 in Iowa; died Jul 1971 in Wheatland, North Dakota. Born 1797, Lightcliffe, near Halifax. Married in 1816 at Halifax Cathedral to Thomas Murgatroyd. Thomas migrated to America in 1821, Hannah followed her husband there the following year where she remained in the U.S. until 1835 when she and Thomas went to Ontario, Canada to reside at South Grimsby township, Lincoln county. Hannah lived here for 54 years before she died in 1889 at about the age of 92 years. * Thomas Murgatroyd of Hiawatha, Kansas, 1889. * Robert Murgatroyd of Ontario, Canada, 1889. * Midgley Murgatroyd of Ontario, Canada, 1889. * Mary [married David Matthew] of San Francisco, California, 1889. * Elizabeth [married George Brant] of Ontario, Canada, 1889. * Charlotte [not married in 1889] of Ontario, Canada, 1889. * Emma [married John Freeman] of Niagara Falls, N.Y., 1889. Ch. 7 Aug 1806, St. Peter's Leeds Yorks. The dates for the births of Edwin and Martha's children indicate that they emigrated from England to the U.S. about the year 1832. Born 1840 Bradford. He married Mary Ella Holmes daughter of Jonathan Holmes, on the 3rd August 1861 at Bradford. Nancy has a marriage record of a William Midgley aged 25 of Horton and Mary Holmes aged 21 of Horton for the 3rd of October 1861 in the Parish Church of Bradford. The marriage was solemnised by William Holmes, Parish Clerk and Christopher Gibson. They migrated to America, their child Mary Ella Midgley was born at Camden, New Jersey in 1880. This is Nancy's grandmother. Mary moved to Coatesville, Chester Co., PA. where she married Charles Henry Brown on the 25th May 1900. Vernon Midgley and Harrell Midgley live in Poteau, Oklahoma where there are currently three Midgley families. Vernon has relatives in Stockton [Marshall Midgley] and Sacramento. Born abt. 1790, died 1882. She married John Grange on the 27th July 1812 at Spofforth, Yorkshire. Jane had a sister Mary who died aged 73 in England [married Willm. Flint]. John and Jane had three children at Sicklinghall, Yorkshire. The family migrated to Forkesville, Pennsylvania in 1818. The Washington family3 armorial bearings as shown in the 1619 Heralds' Visitation of Northamptonshire. The arms may have inspired the American flag adopted by congress in 1782. The red and azure blue stripes and the red mullets [five pointed stars], the latter are the symbolic representation of the knight's spurs. The Washington name was Wesyngton derived from the manor of the same name in County Durham, England. The owner was a William de Hertburn, who took the name Wesyngton from the manors name. Various branches of the family moved to different parts of England one group to Adwick-Le-Street in South Yorkshire, and another to Selby in East Yorkshire. The original Durham family are the predecessors of George Washington. This family probably occupied the manor of Radcliffe, of which now only the moat is extant. Nearby is the Adwick Norman Mound and Bailey. Born 1838 at Sicklinghall, Yorkshire. His father was Joseph Midgley (b. abt. 1800) in Yorkshire Joseph married Ellen [Helen] Mitchell in 1820 at nearby Spofforth. Kelly has extensive information on this family in the U.S. Contact: Kelly Jo [Midgley] Thompson, Arizona. Contact: Bill Midgley, Stockton, California. Born 12th March 1838 at Sicklinghall, Yorkshire. His father was Josephand his mother Helen Mitchel. David emigrated from England to Illinois and then moved to Oklahoma. Samuel Midgley of England b.1841 d. 1916 who migrated to America. Samuel married Sarah b. 1841 d.1908. They had an only son, James Charles Midgley b. 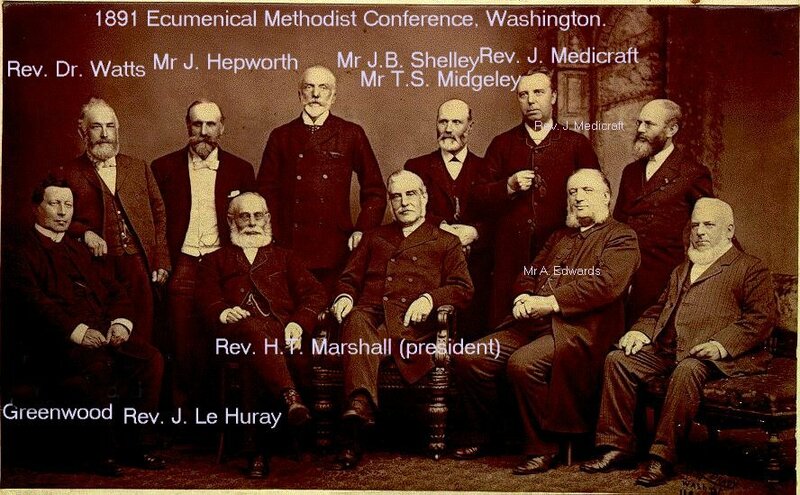 1880 U.S.A. d. 1951 who married Rachael McCleod b. 1882 d. 1954. They had an only son, James Charles Midgley b. 1908 d.1978 U.S.A. who married Anne Higgins b. 1904 d. 1980. Born 9th Dec. 1897 died 12th April 1897, son of John Midgley who married Sarah of Eccleshill, Yorkshire. Born 11th July 1865 at Bradford, Yorkshire, England. Died 3rd October 1950 at Sandford, York, Maine and buried at Oakdale cemetary, Sandford. Sarah arrived in America on the 26th May 1887 at Boston Harbour , Massachusetts, on the ship "Kansas" from Liverpool, England. Sarah Jane Midgley's parents were Robert Midgley born abt.1834 and Clarissa Craven born 9th February 1896 [baptised 12th March 1837] , they were both born in Keighley, West Yorkshire. [married 3rd quarter 1857]. Clarissa died Lowell, Middlesex, Mass. 22nd September 1896. Robert married secondly Sarah McKillof in Lowell, Middlesex, Massachusetts on 20th October, 1897 daughter of Neil McKillof and Sarah McKinnon. Robert probably died in Lowell also but no death date ascribed. Download an Acrobat pdf file for William Midgley and Ann Hartley's descendants in the U.S.
* Martha M. Midgley b.1859, Keighley, West Yorkshire, England. *Sarah Jane Midgley b. 11th July 1865, Bradford, West Yorkshire. * Mary Ann Midgley b.1861, Glusburn. "Kansas" 4th August, 1886]. Hartley married Edith Garfield and had two children, Flora E.
* Lilley Midgley b. between 1868-1869 Eastburn, Yorkshire [Arrived Boston on the "Kansas"
* Craven Midgley born April 1863, at Sutton-in-Craven, Yorkshire, England. He married, in Yorkshire, Sarah E. Morse born June 1864. They both arrived in Boston Harbour, Boston, Suffolk Massachusetts on the ship "Kansas" from Liverpool, England on 4th August 1886. * Albert Midgley b. July 1889, Rhode Island. * Merriam Midgley b. 2nd Jan.1892, Lowell, Middlesex, Mass. * Sadie Midgley b. 22nd Dec.1894, Lowell, Mass. * May Midgley b. 22nd Dec. 1894, Lowell, Mass., died 13th August 1898, Lowell. * William [Willie"] Midgley b.1876, Baildon, West Yorkshire,arrived in Boston Harbour, Boston Suffolk Massachusetts on the ship "Kansas" from Liverpool, England on 4th August 1886. Sarah Jane Midgley later married James Hargraves Bland on the 23rd May 1889 at Lowell, Massachusetts. James was born 6th October 1853 at Idle near Keighley which is not far from Bradford. Sarah and James then moved to Sanford, York County, Maine. Wayne has other details of family members. Louisa Midgley probably born August 1827/1828 England married to James McHale in Norristown, Montgomery County, Pennsylvania in 1848. Louisa may have emigrated from England with her parents and siblings about 1843. Wife Anna b. about 1803, England. Daughter Anna 20 b. P.A. Daughter Ellen 18, b. P.A. Martha daughter 14, b. P.A. Daughtr Mary, 12, b. P.A. Sarah Jane 9, . P.A. Daughter Rebecca Ann, 5, b. P.A. Laurie Burk is looking to find which parish in England they left when they emigrated to the U.S.A.
Born England abt. 1850 and came to New York as a young boy. He has not yet been found on any passenger list. His parents or siblings are not known. He married Rose O'Connelly and had several children at least one of whom was [John Edward Midgley b. 1892] born in Hoboken, NJ. John lived for many years with his daughter's family, her married name was Ethel Paine.Ethel may have had a Midgley family bible which would contain the genealogy of this line.Ethel is no longer alive and Kath is seeking this valuable source of information. John Edward Midgley is Kath's maternal grandfather. Migrated from England in the early 1900's, he lived in Marcellus, NY. Born abt. 1863 at Great Harwood near Blackburn. Migrated to Nova Scotia, Canada initially sometime after 18814. Later migrated to the U.S. and settled in Central Falls, R.I.
Parents were John Midgley born abt. 1822 and Mary Smith. He was a farmer at "Clod" and also grocer of 51, Queen Street, Great Harwood, Lancashire. Christened 30th March 1760 Almondbury, West Yorkshire. married Martha Beaumont born 1765. Their son was Thomas Beaumont Midgley born 2 Apr 1798 married Ellen Collier Hinchcliffe. Ellen was converted to Mormonism and travelled across the Great Plains pulling her own handcart, too poor to buy horses or oxen, but the church encouraged them nevertheless. A large number of the converted perished on the way. Ellen died in Indian Territory by the Platte River. His son John Henry Midgley was born 1858 died U.S.A. date unknown. 2. Ernest who migrated to U.S.A. and died U.S.A. 1952.
who all died in infancy. Modern English and modern 'American English' seem at times very disparate. I think we can put much down to the fact that many English migrated in the 1600's to what were then the American Colonies and took some of their early English with them. To some extent this has survived with more recent colloquialisms added. Did you know that the English use the word 'fortnight' meaning two weeks or fourteen nights whilst modern Americans do not. Americans never use the phrase 'a week on Friday' or similar. The word 'gotten', not found in English, like the word 'yeah' is a word brought to the New World by German migrants and taken up by others. Words like post, guard's van, rubbish and transport are replaced in U.S. English with mail, caboose, garbage and transportation. The latter in English means to be taken to the colonies as a prisoner! Most of the spelling differences can be attributed to the fact that English spelling in England was formalised first by Dr. Johnson's attempts at an early dictionary in the 1700's, well after the Pilgrim Fathers and their followers had departed the shores of the Motherland. Perhaps you have discovered other differences on your travels. The similarities, thankfully, are great enough that we can still understand each other! 2. Pittsburgh City Directory for 1892. 3. Bedingfield Henry, Heraldry, Bison, 1993. 4. British Isles census for 1881. © Tim Midgley, 2000, revised 19 July 2018.